Have you ever watched a movie to see a family having a fabulous picnic with decadent spreads of sandwiches, sparkling wine, and fruits, and think, “Wow, that looks like fun?” Well, now that picturesque picnic can become a reality with a traditional, handmade picnic basket from Peterboro Basket. A New England classic, the Peterboro Basket Company has thrived for over 150 years in the heart of Peterborough, New Hampshire. Founded in 1854 by Arnzi Childs, the company went through many ups and downs, including fires that blazed through their business and moves to other locations, but the quality of its handmade baskets always remained the same. More than a business, Peterboro Basket is a Yankee tradition. It is what you think of when you picture a classic, wooden picnic basket. 150 years later, you can still see the attention to detail in every basket made. Each basket is made from Appalachian White Ash. The same hardwood that baseball bats, snowshoes and axe handles are made from. The wood is harvested from Maine, Vermont and New Hampshire. Each basket is made at the oldest manufacturing company still producing goods here in the United States in Peterboro New Hampshire. So take your family out on a beautiful summer day and treat them to a special meal on the beach, in the park, or even in your backyard. Adults and children alike will love the fun and delicious food that is associated with this classic picnic basket. 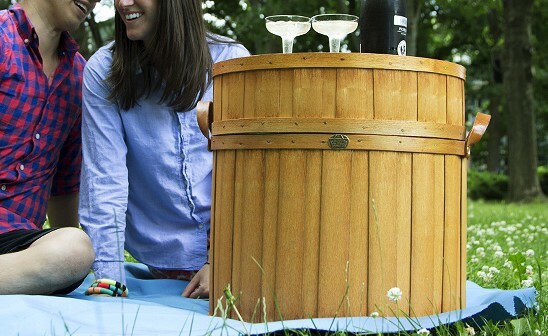 More than just a picnic basket, the Peterboro Basket is an experience for the whole family. 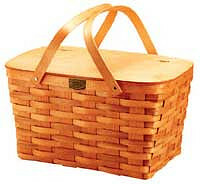 Have you ever watched a movie to see a family having a fabulous picnic with decadent spreads of sandwiches, sparkling wine, and fruits, and think, “Wow, that looks like fun?” Well, now that picturesque picnic can become a reality with a traditional, handmade picnic basket from Peterboro Basket. A New England classic, the Peterboro Basket Company has thrived for over 150 years in the heart of Peterborough, New Hampshire. Founded in 1854 by Arnzi Childs, the company went through many ups and downs, including fires that blazed through their business and moves to other locations, but the quality of its handmade baskets always remained the same. More than a business, Peterboro Basket is a Yankee tradition. It is what you think of when you picture a classic, wooden picnic basket. 150 years later, you can still see the attention to detail in every basket made. Each basket is made from Appalachian White Ash. The same hardwood that baseball bats, snowshoes and axe handles are made from. The wood is harvested from Maine, Vermont and New Hampshire. Each basket is made at the oldest manufacturing company still producing goods here in the United States in Peterboro New Hampshire.